Last week I showed you my courtyard all dressed for Spring and now I would like to invite you into my kitchen. 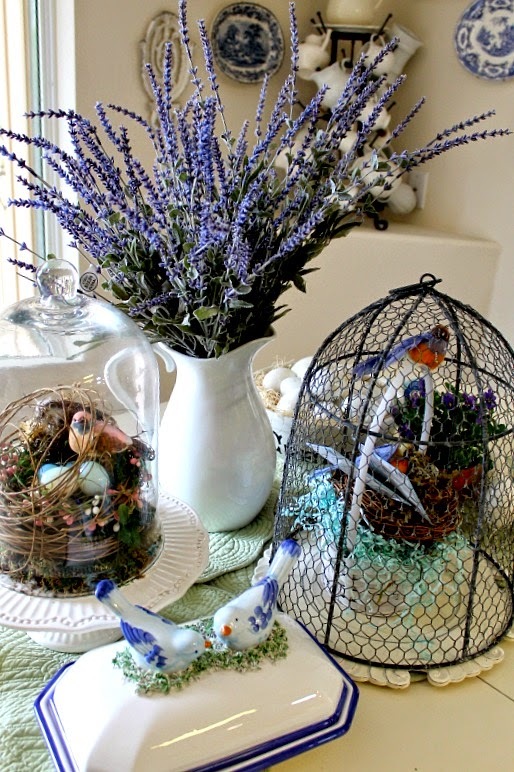 I hadn’t really planned on doing Spring decorating in the house until I started seeing all the beautiful vignettes you have posted. You inspired me to do something simple on my kitchen table. 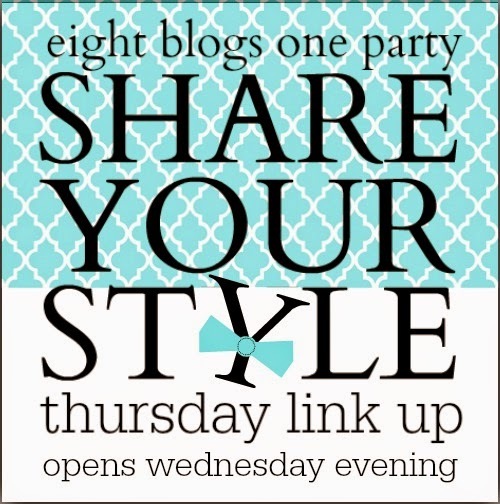 Thanks for dropping by and I look forward to seeing you at this weeks Share Your Style Party. I just love what you have down with that room and the spring decorations have made it even prettier! It looks so pretty and cheerful for Easter. 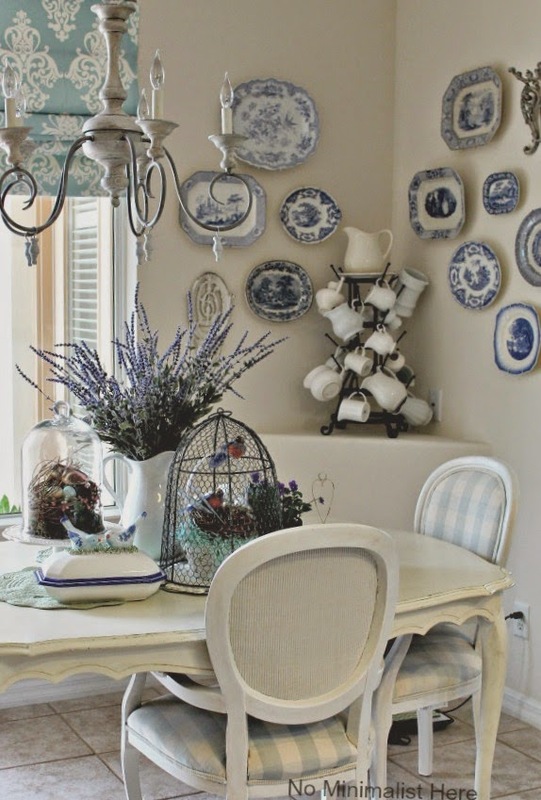 Love seeing your eating area in your kitchen with all the blue and white. So pretty. Very pretty ! 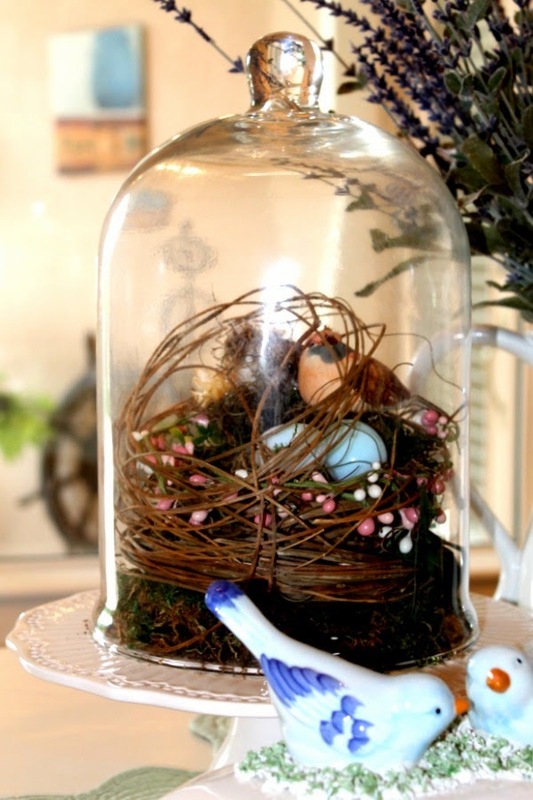 Love the cloches filled with spring! Shery, I love your blue & white dining area. The pops of color from the arrangements really make it all sing! I was trying to find the fate of those chairs – they look as I remembered them originally (gorgeous! ), but I also remember you saying you had a major spill on one during the project process. LOVE the lavender and blues in your white kitchen! So fresh and pretty Sherry! Love it, this is so pretty. 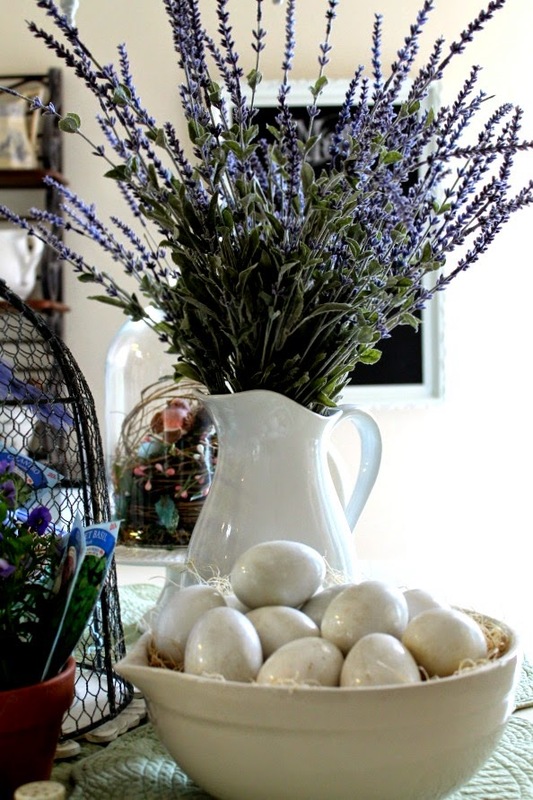 Love those eggs in the bowl, they look fabulous. Sherry, I love your dining room – the white, buffalo check and all the blue and white plates. So fresh and lovely! Your Spring touches are perfect! so prettty, Sherry! LOVE all the blue/white dishes and that precious bluebird covered vegetable. Oh, and yours chairs are wonderful! I love the whole vignette, Sherry. The dish with the birds on the lid really stole my heart! I always enjoy seeing your dining area. I love that table and chairs. You've done a wonderful job getting it ready for Spring. Love your Spring decorations. The softness of the classic blue and white combined with the purple florals is so refreshing!!! I adore a n y thing with birds!!! 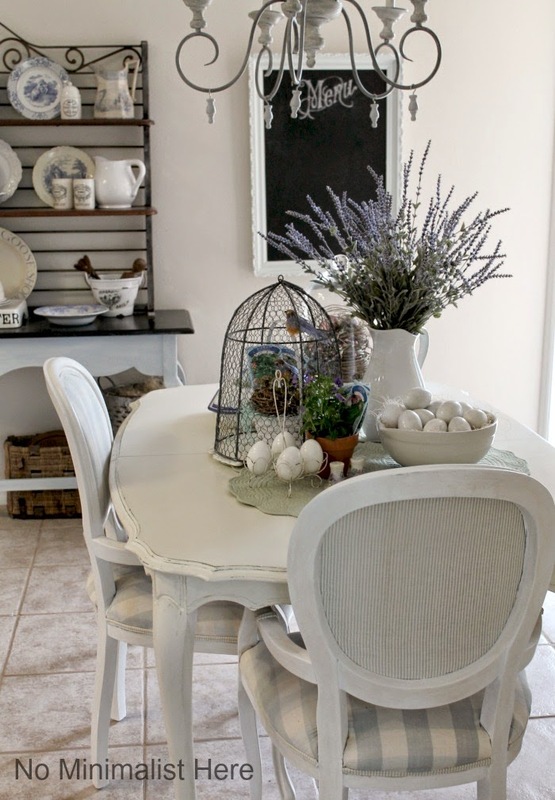 I love the blue and white on the diningroom chairs, such a pretty room! Oh Sherry – it's just GORGEOUS – those chairs are so beautiful……. And your styling is just so perfect! I love your white kitchen set. Gorgeous. Hi Sherry! 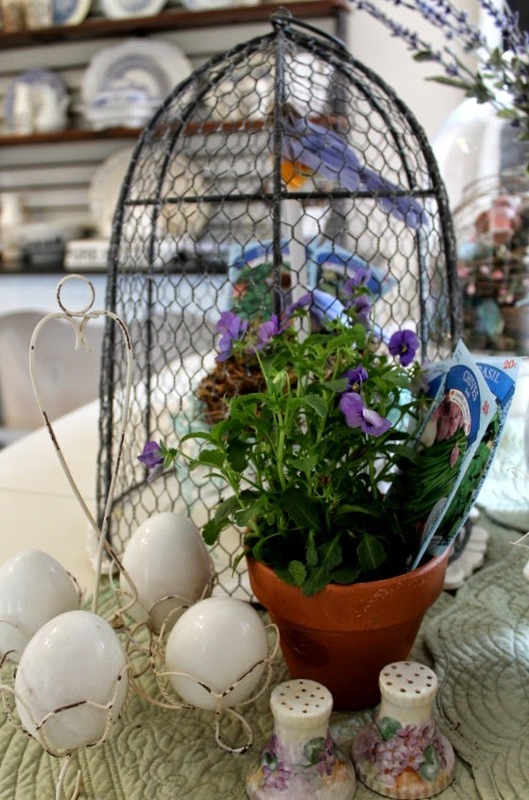 What a fabulous Spring vignette! All of the touches of blues in the birds goes so well with your great collection of blue and white plates on your walls. I love buffalo checks…they seem so timeless. Thanks for sharing photos of your kitchen dining area with us. 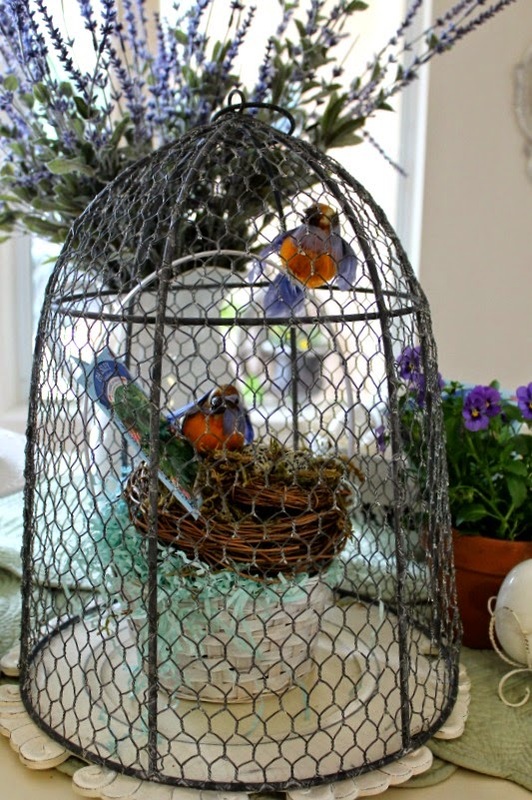 I stopped by for a closer look and to do some pinning….LOVE that centerpiece vignette! So pretty and I love the chandelier over your table Sherry.